From nature brown gray and erath tones brown gray subway slate backsplash tile ideas, photos and pictures. Brown kitchen cabinets, black granite countertop with subway slate backsplash tiles. PHOTO CREDIT | HOMETECH RENOVATION, INC.
@Black granite countertop, brown kitchen cabinets, Brazilian subway slate kitchen backsplash tile. @Dark cherry cabinets, black countertops and two islands in the middle with white cabinets and brown countertops. Brazilian slate subway tiles for a backsplash with framed 4×4″ slate tiles laid diagonally in the opening behind the cooktop. @Dark cabinets, black countertop and hardwood floor with stainless steel appliances. Custom designed backsplash made out of 3×6″ subway slate tiles and a 4×4″ diamond shaped slate tiles framed in a rectangular behind the stove. @Dark cherry cabinets and black countertop. Slate subway tile backsplash running all the way up to the ceiling behind the sink and around the window. @Kitchen island with black cabinets and Santa Cecilia countertop. Light cabinets with slate subway tiles backsplash running all the way between the countertop and the cabinets. @Kitchen desk area with black countertop and slate subway backsplash adding warmth with those earth tones. @Dark cabinets and black countertop with a multicolor slate subway tile going all the way up in the opening behind the stove. @Dark cabinets and black & stainless steel stove. Black countertop and light hardwood floor with multicolor subway slate tile to add up some warmth. @White and dark cabinets with Santa Cecilia countertop and stainless steel stove. 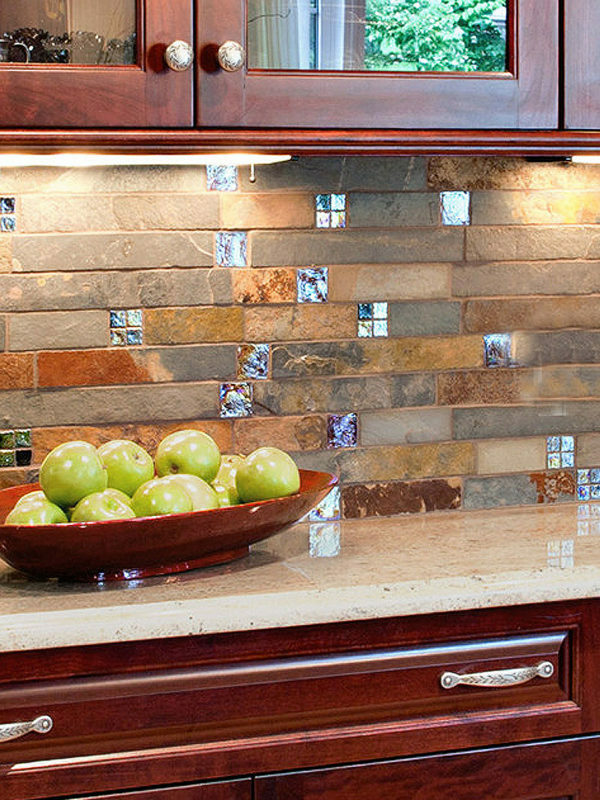 Slate subway backsplash, staggered with light grout to create that brick look. @Spaceous kitchen area with two level kitchen island with dark cabinets. White cabinets on the back with Santa Cecilia countertop, and a brick looking slate subway tiles backsplash. @Stove area with white and dark cabinets and a brick looking slate subway tiles 2×4″ for an excellent decoration. @White cabinets and stainless steel appliances. Light beige countertops on the kitchen island and the back with a 3×6″ slate subway tiles backsplash. @Light beige and peachy countertop and white cabinets beautifully combined with a slate subway backsplash. This entry was posted in ANTIQUED, BROWN, SLATE, SUBWAY. Bookmark the permalink.